In an earlier post I wrote about my attempt to take out a Synaptics Touchpad form a laptop and connect it to my computer's PS/2 plug. The Synaptics Touchpad pinout seems to be different for each model, so be careful not to fry the circuit! Triple check every pin and connection before you power this up. Also remember that the touchpad is not plug and play: you need to connect it to your computer before powering it on. I have used a Synaptics T1006 0544 touchpad. 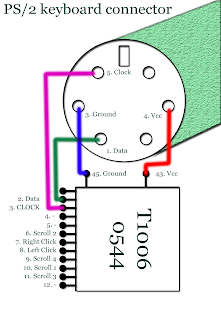 The pinouts for the PS/2 keyboard connector and the Synaptics T1006 0544 touchpad can be viewed in the schematic below. Synaptics Touchpad to PS/2 connector. 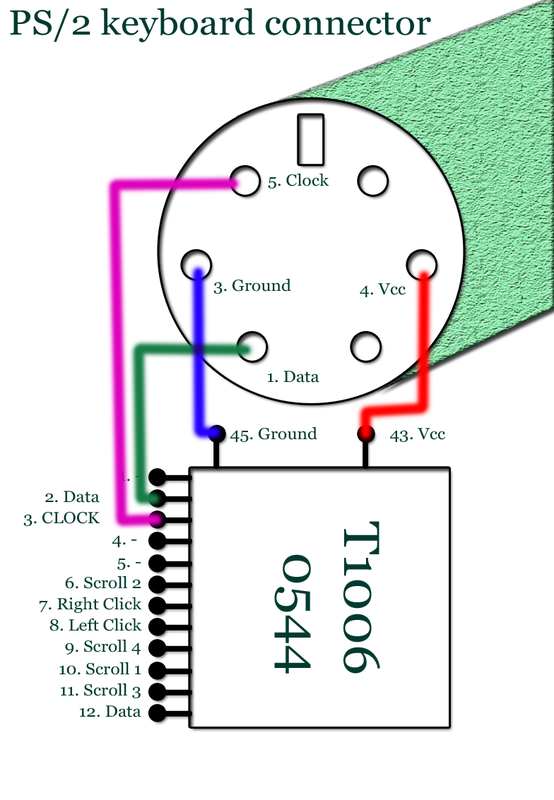 You can observe in the schematic that I only connected the communication pins (Vcc, Ground, Clock, Data). The pins Left Click, Right Click, Scroll Left, Scroll Right, Scroll Up, Scroll Down can be linked to external buttons (I haven't done that because the Synaptics software allows default scrolling and normal tapping). For the right mouse button you can define a corner of the touchpad that when tapped will trigger the right mouse click action. I'm planning to do the same with a spare touchpad that I've got, but mine is a t1006 0531 model from an Acer laptop. Any posibilities that the pin out for both touchpads would be the same? Well, it might work. Unfortunately synaptics haven't published the schematics. Take a look at the second post too: Synaptics Touchpad on my desktop, maybe the pictures will help you. Word of advice: triple check the connections before powering (plugin in) the device, because I damaged a touchpad when wiring it the wrong way. If the chip heats, remove the power immediately. Congratulations, It's awesome that you accomplished that! Data/CLK logical signals, I don't think they'd burn the touchpad if reversed, but you never know :). You can install the Synaptics driver for windows and in control panel -> mouse, you should find the Hot Corner settings for the right click, or maybe even gestures and multitouch settings.